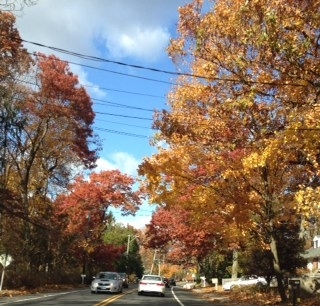 Last fall my husband, Tom, and I traveled to a small town out on Long Island in New York, where he grew up. The old hometown! We went there to see a friend of Tom’s he had known since he was six years old. This childhood friend had just lost his wife of 20+ years to ALS, an insidious disease. We went because we love this man and hurt for his loss and wanted, at the very least, to be there in solidarity with him. We don’t get back to New York often so when we do there is always the sentimental journey taken through the neighborhood. The family home was typical of the modest houses built in the midcentury, post -World War II days of rapid growth, triumphant patriotism, and unbridled optimism. Located on a cul-de-sac, this house, this yard, and neighborhood had been the center of a young boy’s universe as he spent countless hours alongside a gang; his gang, baby boomers who would rather be outside playing sports than anywhere else in the world. As we drove up to the house Tom commented on how small the backyard looked, not at all the way he remembered it. This yard and those around it had been baseball diamond, football field, and basketball court to a group of young aspiring athletes for whom the future was most assuredly of major league proportions. Once the hub of dreams, it was now strangely unfamiliar in its smallness, not even big enough for the memories that had grown there. The boys grew up to be men, and the responsibilities of adulthood outgrew boyhood dreams. Their lives are much larger now. Marriage, children, grandchildren, divorce, life, and even death have replaced their innocent bravado with seasoned maturity. However, they have never outgrown the bond of their friendship. The impact of the history they shared with one another has grown in depth, enduring time, distance, and sometimes neglect. While there may be significant gaps between visits or communication, there is an unspoken code that brings them together for the significant life passages. Whether it was weddings in their twenties and thirties, high school reunions in their forties, or now in this moment of losing a spouse, they are there for one another. Some may not always make the occasion with their physical presence but there is always a touch, either through phone call or email. And when they get together…well it’s really hard to see that any of them have actually grown up at all. It is a wonderful thing to watch! They still give each other a hard time, reliving old childhood antics, making some up as they go along I suspect. The more “adult beverages” consumed the more boyish the stories become. Talking sports and neighbors and cute girls that got away. Embarrassing stories. Funny stories. Life giving memories that hopefully they’ll never outgrow. It does my heart good to see the refreshment on Tom’s face and hear his unabashed laughter. The curious thing is, when they get together, there’s hardly ever talk about what they do for a living, what accomplishments or disappointments they’ve had through the years in their careers. I haven’t heard them talk about whether or not they lived up to their boyhood potential. Because when they get together, it just doesn’t seem to matter who does what. There’s something much more significant happening beneath their carefree and sarcastic banter. It’s about who they are to each other and who they are when they come together. It’s something almost beyond description, but, to me, most closely resembles unconditional love. And unconditional love is something that can never be outgrown but expands with time. Something to chew on…. This entry was posted in boomers, Faith, friendship, Lessons Learned, Life, unconditional love and tagged boys, faith, friendship, heart, new york, unconditional love. Bookmark the permalink. Another wonderfully poignant entry to your blog. I can tell you first hand, how very much it means to have life long friends gather when one has lost a spouse. It is those innocent years that the grieving somehow long for. A precious gift you gave to Tom’s friend. Thank you for your inspiring words from your heart. Jane, you’ve beautifully captured the essence of time here, and the Reality that all time is One Time when love permeates it… thank you for sharing this beautiful experience! Thanks, Lisa! I always love your insight!